Promotional products, advertising specialties, swag, tchotchke, trinkets or ‘stuff’, are proven time again to be advertising that works – and the least expensive media per impression. They work because people don’t throw away free stuff or a gift. They are fun and very useful items. Your prospects and customers wear, display, play with and most importantly, USE your logoed item. They may give if away, but rarely will anyone pitch it. The bag was one of the first promotional products ever used. In 1886, a newspaper man, Jasper Freemont Meek, witnessed a young student drop his books in the mud. He took an idea of increasing sales for a friend’s shoe business. With “Buy Cantwell Shoes” printed on a burlap bag, every child who bought their shoes at Cantwell’s received a printed book bag. It was a successful campaign for both Meek and Cantwell! 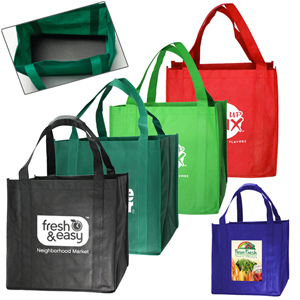 Many organizations will use promotional bags for brand awareness. The bags, and other promotional products, can also be and important ingredient in your marketing mix. Rarely am I asked anymore at the grocery store “Paper or plastic?” Stores are encouraging shoppers to BUY reusable bags. While the paper and plastic bag is on their way out, consider your unique, large tote ‘in’ your customers use before your competitors do. Increase brand awareness and encourage your customers and prospects to use your bag. Not only will your large totes be used at the store, but at the beach, library and picnics! As a consultant, I receive samples that I share with clients and sometimes use myself. With bags and totes being one of the most useful items in the industry, I decided to take a look at the success of these lunch, book and necessity-carrying-walking advertising billboards. Personally I have collected nearly 10 promotional bags and totes within the last year. The bags came from running-race expos, sporting events, memberships and business luncheons sponsors. Each has its own look, size and use. For a day in the city, I need a larger bag to fill with reading material, a change of shoes, a water bottle and an umbrella. When cycling, I just need to carry a few bucks, lip balm, tissue and small spray of sunscreen. Wherever I go, I need a bag and while zipping past a few 100 people in a given day – at least one logo is proudly displayed. During a recent city visit to the city, I kept a log of the totes and bags I spotted on the sidewalks. I declare, that these imprinted bags, totes, backpacks and slings are, to the city, what t-shirts are to a high school! Yes – billboards of logos attached to people everywhere. Waiting for the train I saw three bags were clinging to people right next to me in line. There was a bank logo, (major marathon sponsor) on a canvas tote, a computer network logo on a messenger bag and a major hospital logo on another canvas bag with contrasting straps. The owners had important items in their bags for use through the day. Inside these bags a change of shoes, a lunch and a little take-home-work. The bag was the perfect-size for these wearers. They probably had more at home, but for these advertisers imprinted, from train to the streets of Chicago, their brand was out-there fully visible! What are your customers going to use to carry their cell phone or tablet to the beach this summer? A waterproof tablet pouch would be perfect. Another HUGE increase in bag use is the airline carry-on. 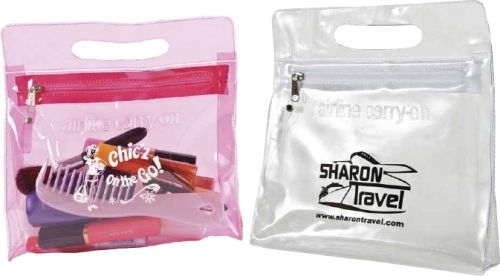 Printsations will set your company up with a super clear or tinted zippered bag perfect for toiletries, cosmetics or prescriptions. Your brand is clearly visible on a product that anyone who travels needs! According to a national advertising trade group, bags are considered one of the most useful of promotional products. Logoed bags are tied with writing instruments as having the lowest cost-per-impression than any other promotional product, and your investment is going to have a lasting impression. The uses are endless, the prices are a favorable cost-to-benefit ratio and areas of imprint are large. Let’s get your brand toting!! !